to restore Mother Earth to its Pristine Glory…!!! What is our duty in the present times to our nation and the world at large? Young men and women must spring into action and strive to create a resurgent India, and a happy and peaceful world. You must overcome the desire for power and instead firmly implant in your hearts the desire to uproot corruption and immorality, and also the urge to work hard. Even as it is the duty of children to serve and please their mother, so it is the bounden duty of every child of the nation to make her happy. To serve the Motherland selflessly should be the sacred ideal of life. You must embrace the lofty ideal of national unity and engage yourselves in dedicated service to the nation. Only when man upholds morality, can there be equality, fraternity and freedom in the society. The Mother Earth has witnessed the glory of several greatest personalities such as Kings, Emperors, Political Leaders, Warriors, Saints, Sages, Spiritual Gurus, Maha Yogis, Religious Founders, Highly Erudite Scholars and Interpreters of Scriptures, Philanthropists, Actors, Artists, Sculptors, Sportsmen, Doctors, Surgeons, Billionaires and Trillionaires, Economists, Industrialists, Scientists, Social Reformers, Educationists, Critics and many others. But still, she was not happy till she received the Golden Sunrays in the early morning hours of 23 November 1926 presenting amongst celestial sounds and an illuminating child on the sands of a dusky village of Puttaparti in South India. She saw the birth of an extraordinary and unparalleled, incomparable, incredible, inexplicable, incomprehensible child who was mystical and mysterious, having been endowed with unimaginable supernatural powers since his birth beyond the range of the five fundamental elements (Earth, Water, Fire, Air and Space); let alone the ambit of physical sciences. Sri Sathya Sai Baba to continue the lineage of Sri Shirdi Sai Baba as per latter’s prophesy. 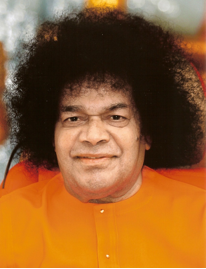 Sri Sathya Sai Baba’s beam of wisdom would cut across all barriers of race and religion. His prime mission was to establish the Unity of Faiths and people under the common banner of Universal Love and Brotherhood. For over eight decades, He had been tirelessly working to restore sanctity and dignity to human life. His sacred teachings reached out to people in all countries conferring the spiritual dimension that can transform life. Sri Sathya Sai remained in ordinary worldly covers till the age of 14 (i.e.1940), when he realised the futility of worldly education and so left His school without even completing secondary education. Sri Sathya Sai left the school and severed the ties binding Himself only with His family and declared that the entire world was His family. His leaving the home and breaking the family ties was not aimed to do penance for seeking God or for Self-realisation as was the case for several seekers in the history who later became Enlightened or Siddhas or Spiritual Masters. He was born all this. He could not bear the suffering of mankind in terms of non-fulfillment of material necessities, spiritual ignorance resulting into lack of awareness about the purpose of life and the methodology to lead a happy, joyful, peaceful, and blissful life. Is it not a miracle that a young boy of 14 realises the futility of the prevailing system of education and decides to dedicate His entire life for reformation, reconstruction and transformation of human character by providing true education which would unfold the latent human values? Is it not a miracle that He devoted His entire life to render selfless service to the people of the world for raising their standards of life in addition to standard of living? Chamatkar: Ordinarily Chamatkar is considered as a miracle for which there is no scientific explanation. That is because; science is limited to matter and energy. Beyond the realm of science, there is Consciousness and Supreme Love (also called Divinity) which cannot be codified in laws. Sri Sathya Sai’s creations were manifestations of that Consciousness and Supreme Love to plant faith in Divinity in the mind of the beneficiary. Sanskar: Sanskars are human values (Virtues) intended to transform, transmute, reconstruct and reform the mankind. Chamatkar leads to Sanskar. Paropkar: Paropkar means obliging and helping others in distress. Sanskar makes the person humble servant of the society. Sakshatkar: The expansion of Love through Paropkar makes a person aware of the Cosmic Love exhibited in himself and in everyone around. This is Sakshatkar or Realisation of Self as Universal Identity. The Nature is a Limb of Divinity. All these are synonymous. They lead to Chamatkar, Sanskar, Paropkar and Sakshatkar respectively, which ultimately grant Happiness, Joy, Peace and Bliss respectively. He presented Himself to the world as a Friend, Philosopher, Guide and Saviour to all the people irrespective of caste, creed and country. Just in order to fulfill three little wishes of His pious mother Easwaramma – a school, a dispensary and a well for the village, Sri Sathya Sai made the world His village. 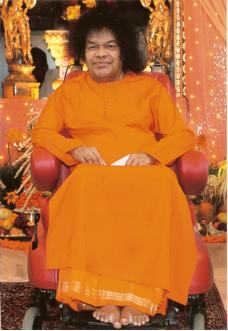 Towards Educare, Sri Sathya Sai introduced the Integral System of Education integrating Head (Thought), Heart (Word), and Hands (Deeds) right from the Kindergarten level to the Post Graduate / PhD levels. He established Schools, Colleges, Universities, Institutes for moral and Value Education. Towards Medicare, He established dispensaries, general hospitals, wellness centres and state-of- the- art super speciality hospitals. Towards Sociocare, He provided free housing to the under-privileged populations and potable drinking water to a number of drought-affected villages in many Indian states (thereby inspiring other countries in the world also). Towards Agricare, He established Institutes for Agriculture and Bio-technologies and Towards Ecocare, He always advocated importance of the protection of environment by maintaining ecological balances and preventing global warming. All these were free of cost to one and all without any discrimination of race, colour, caste, creed, religion, nationality or economic and financial status. 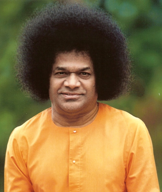 Sri Sathya Sai always believed that Education and Medical Aid are the basic birth rights of all human beings. He also propagated the ideas of globalisation, de-commercialisation, humanisation and spiritualisation of medicine. 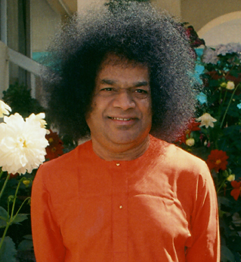 Sri Sathya Sai’s Life, Message and Work came as a heavenly light to illumine a new path for peace and progress. Founded under the guidance of Sri Sathya Sai, the Sri Sathya Sai Social Service Institutions are built on the bedrock of spiritual care and love for every human soul across continents. As we all know, more than two years have passed since Sri Sathya Sai dedicated His Physical Body to the Mother Earth. This was perhaps in response to a call made by her for establishing equilibrium against the rampant violation of Natural Laws recklessly caused by mankind in pursuit of craze for maximising sensory gratifications. Let us re-capitulate what Revered Bhagavan had advised us on some occasions in his physical timeframe. Imagine now, when the gross Physical Body of Swami could radiate these three rays, what could be the quality of rays being emanated now from His Subtle Body? They would certainly be Mahakarana or Blissful rays showering on the entire mankind. But the trouble is that man has closed the gates of his edifice preferring to live in ignorance. Yet on another occasion, Swami kept the role model of Sri Hanuman before the Members. He said, “Hanuman was ordered to discover the whereabouts of Sita and he obeyed implicitly, without question, and succeeded. He did not calculate the dangers of the journey and hesitated; he did not feel proud that he was chosen for the high adventure. He listened, he understood, he obeyed, he won. The title Ramdoot (Messenger, Servant of Lord Sri Ram) that he earned has made him immortal. You earn the name Sai Ramdoot. Have fortitude and self-control; use good and sweet words, and examine each act of yours. In one of the discourses Swami instructed, “……. Active workers engaged in service should realise that there is nothing greater than service and seek to promote Love of God, Fear of Sin and Righteousness in society as the highest values to be. There should be no pretense in manifesting love. It should be based on the conviction that the Divine is present in every one, Do not arrogate to yourself any authority or power and claim credit for any achievement. All your name and fame are due to your association with Sai Organisations and the use of the Sai label. …….. It is the Sai Name that has conferred on you distinction and recognition. Therefore, bear in mind the Name Sai and carry on your work. All should work together and share in harmony, act together, move together, grow together and share the common knowledge and experience with all. We want people who will completely identify themselves with the Divine Mission of Sri Sathya Sai. On another occasion of Swami’s Birthday, He said, “Having come to this place and availed yourselves of this opportunity, treasure in your hearts the things you have seen and heard and resolve to plunge into practicing them. Your resolution and practice must happen simultaneously. Have a Master Plan and start from tomorrow the execution of the programme, drawn in consultation with others. This must happen to all countries. Do not think that only the India and the State of Andhra Pradesh is Sai’s. All countries are Sai’s. All are one. We must endeavour to realise by all means and establish this truth in this Kali Yuga. Many a time you may have to hear envious remarks and criticisms from some spiritual organisations about the spectacular and unprecedented achievements made by Swami in the fields of Educare, Medicare, Sociocare and Agricare, Rural Development, Massive Projects of Drinking water Supply, etc. On such occasions we are reminded of His remarks, “The attempt to darken the splendour of Sai can never succeed, except by one means: Suppose Sai Splendour is indicated by a line of certain length. Effort to shorten it by wiping or erasing it will not make it shorter. But if you draw by its side a longer line, automatically it will become shorter. So do the things that Sai is doing, on a grander and more impressive scale, then the fame of Sai will certainly diminish …….. .” You can use this analogy. It would be appropriate for all of us, at this juncture, to contemplate on what Swami instructed us while carrying out His Mission from time to time. Sri Sathya Sai came to teach us the universality of faiths, the divine consciousness, the path, philosophy, duty and the obligation of love. Nowhere in the history of the world has any single individual established such a magnanimous task in his own lifetime. What is even more promising that all these unique institutions have no membership fees and are governed by unregistered charter for the conduct of their affairs. Collectively, these institutions represent the largest selfless, totally voluntary Service Corporation ever in the history of the human race. Yes, Sri Sathya Sai came among us in order to achieve the supreme task of uniting the entire mankind, as one family through the bond of brotherhood, of affirming and illumining the Atmic Reality of each being in order to reveal the Divine which is the Basis on which the entire cosmos rests, and of instructing all to recognize the common divine heritage that binds man to man, so that man can rid himself of the animal and rise into the Divine which is Goal. 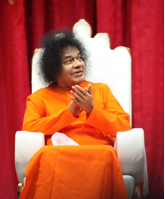 It is to the credit of Sri Sathya Sai avatar that for the first time in the history of mankind, the Avatar simplified the understanding of spirituality and explained in a simple way the actual process of transformation based on the human workshop. In this sense, the Sri Sathya Sai Avatar was unique in respects. If one has to ask question as to what is the one single largest contribution of Sri Sathya Sai Avatar in the 21st century, what would the answer be? It would be ‘En-mass transformation of mankind and thereby the whole world’. His approach made Him the most scientific Avatar when He said, ‘Come, Examine, Experience, and only then develop faith’. There is no question of just blind faith. Prashanti Nilayam is the only place in the world where people of different faiths from different parts of the world congregate to celebrate their religious festivals. Cultural festivals highlighting values of all religions from both East and West are organised with gaiety. Scriptural studies of all faiths create oneness of purpose to attain Divinity. To millions, Sri Sathya Sai was and still is not only a friend, philosopher and a guide but also the saint, the Seer, the Super Human and almighty personality performing multi-dimensional roles by serving the society, but also a versatile personality performing multi-dimensional roles as Brahmin (Knowledge Facilitator), Kshatriya (Warrior for Justice), Vaishya (Creator of Wealth) and Shudra (Server to the Society), A Complete Leader, A strategist, the World Redeemer, the Universal Purifier, the Universal Communicator, an Economist, a Scientist, a musician, a doctor, a surgeon, a teacher and the Social Architect of the Millennium – loving, serving and uniting all, at all times. He has created many beacons and lamp-posts for guiding mankind in the twenty first century. The onus of benefitting from those is now on us. If we follow the light emerging from these beacons, we can look forward to sanctifying our personal, family and community life. IN PRACTISING THESE PRECEPTS WITH HEAD, HEART AND HANDS. a variety of tunes. That should be the ideal. extinguish the flame of unity. "Love is my form, Truth is my breath"